Soldiers from Ft. Myer frequently are out training on the trail from Rosslyn to Washington. These three guys, fully dressed and carrying packs, hiked from Ft. Myer to the Capitol and back -- 9.2 miles. They're looking forward to competing in the national Military Police Warfighters' Competition. 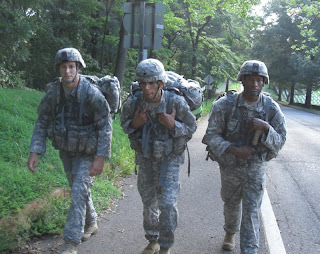 Last year, a contingent from the 289th MP Company, part of the 3'rd U.S. Army Infantry Regiment (The Old Guard), took third place in the competition. The typically weekend warrior competing with lethal intent knows nothing about real war. These guys know a lot about real war. That probably makes mere competitions more fun. To all warriors, real and imaginary, enjoy opportunities to have some fun!